BAFTA long-listed short Edith offers an authentic and emotive glimpse into one of the most prevalent but heart-breaking taboos of our times, loneliness in later life. 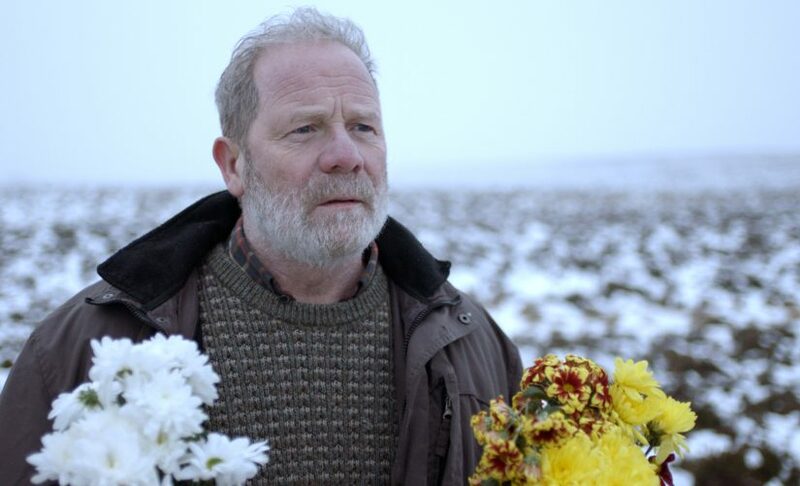 Jake (Peter Mullan) might be an elderly widower but, still fit and active, he has plenty of life’s road left to travel. Nursing a solitary pint in his local, he prefers to be left to his thoughts, ruminating on adjusting to existence in the wake of his recently departed love. Armed with a brave face, surrounded by the cocoon of grief that people feel too intrusive to pierce, he’s …getting by okay. But all is not as well as the image he’s projecting. The deceased Edith is still with him, stubborn echoes of her presence shielding him from facing up to the reality of being on his own. Shielding him from the pain in something as mundane as having to make just one cup of tea. Only garrulous pub acquaintance Shelia (Michelle Fairley), sensing that support might be needed most now, after the initial wave of sympathy has died down, tries to reach out. We witness flashbacks to the young couple’s courtship and pivotal moments in their early relationship. We piece together that Edith’s passing has left him exposed to the residual traumas of the past, alone. They’d always been able to confront such things together. Until now. Mullan acts with the understated precision of a master. It’s all there in his eyes. And the afflictions of a life fully lived inhabit every craggy line on his face. Stately and eloquent cinematography finds beauty in a barren backdrop. The snow on the ground covers earth that has memories, both happy and unhappy, frozen within it. Striking an optimistic endnote, achieving a remarkable amount within just a fifteen-minute runtime, this is a subtly underplayed composition and all the more powerful for it. A personal and poignant portrait of the all-too-common burden of solitariness. Solitariness brought on by grief, which in turn makes that grief so much harder to bear. Speaking with a volume that belies its small package, it concisely articulates a philanthropic message that stays with you. The accomplished and affecting Edith has a spirit that lingers.